It is used to improve insulation or thermal efficiency in a window, a thin film coating is applied to the raw glass. The process is done at the glass manufacturing plant where specially designed coatings are applied to one or more surfaces of an insulated glass unit. For example: usually the glass is coated on the inside of the outer pane for double-pane windows. This film coating reflects radiant infrared energy, which is meant to keep the energy on the same side it originates from while still letting in visible light. 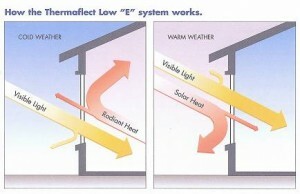 So when the sun shines, a Low-E coated window reflects a lot of that unwanted energy back towards the sun instead of letting the heat pass through the glass. It works the same way if you are running your heater. The energy from your heater comes up against the Low-E window and is reflected back toward the inside of the house so it isn’t lost. keeps heat from passing through your glass. During cold weather, the heat from your home is protected and sealed inside.